Are you finding it hard to shift those last few pounds? Are you like me in the way that no matter how much dieting and exercise you do, the weight goes from one area and not another? I think I’m Kardashian-like in one respect in that I’m blessed with a naturally large derrière. The curse of a naturally large behind (as we all know there are rumours about the Kardashians achieving theirs with fat implants) is that the fat deposits on the bum lead themselves more naturally to cellulite. While it’s great to have a bottom that looks peachy in jeans, it’s not ideal to have a rear that looks like moon craters when you’re in a bikini and lying on the beach. 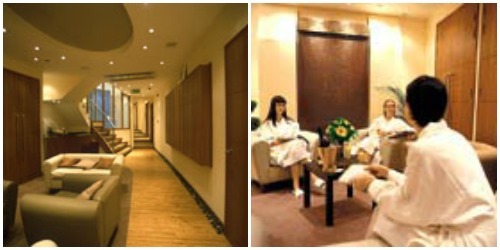 So I decided to book into the Cobella spa in Kensington, West London to do something about it. There’s a treatment called Technispa, which uses electronic currents to push the advanced Guinot slimming / anti-cellulite gel to areas under the skin that couldn’t be penetrated from simply rubbing on cream / gel. The area where cellulite gathers is deep under the skin so working out doesn’t affect it either as it’s not in a place where it can be broken down through better circulation. As I’m about to go on holiday to Malta where I’ll be staying in one of the best hotels in the country – the Corinthia St George’s Bay hotel and spa – I need this anti-cellulite treatment! My first impressions were better than expected. The spa is located under the Cobella hair salon on High Street Kensington but from the moment you descend the last stair and sit on one of the comfortable sofas in the reception area, you completely the hustle and bustle off outside. With no noise from anywhere you could be in the spa of a posh hotel and posh is certainly a good word to describe it. In the changing, nothing is scrimped on. You’re given a dressing gown so soft you could cuddle up in it and go to sleep, along with spa slippers. By the mirrors, there are bottles of luxurious Guinot products – cleansers and moisturisers. Hair dryers and hair straighteners mean you can fix up and look sharp after your treatment. After an hour’s pampering, it’s so easy to look sleepy and bedraggled but if you’re fitting it into a working day, like I was, then the hair straighteners are much appreciated. But I wasn’t there for the changing rooms, I was there for a Technispa treatment. It was with some trepidation that I lay on the bed, wondering how much pain I was in for. My treatment was carried out by the spa manager, Georgia Mann, who did a lot to reassure me. We started by discussing my concerns (the backs of my legs) and decided that the best use of that time was to focus on that area rather than treat the fronts of my thighs, which I don’t have a problem with. Georgia also told me it doesn’t have to be painful in order for it to be effective. The current doesn’t hurt at all, it’s actually quite relaxing. But there are different levels of suction to create a vacuum between your skin and the air to push the cream down. If you’re not used to the suction it does feelpainful if you go for a high setting. I decided to keep it light as it was my first experience of it. Besides, it’s the current that stimulates the cells, not the suction. At this point, I have to admit I did not take any photos of myself having it done as I didn’t think any of you readers would want to see my cellulite. That’s way too much information! So I found another photo online of the Technispa treatment device (although this is not at Cobella). You hold one end of the current in your hand to give it a full circuit around your body. The therapist works the other over your problem areas. It’s not a scary device and as long as the suction is at the right level you can close your eyes and chill out. The treatment lasted 30 minutes and that passed so quickly that I didn’t want it to be end (which just goes to show that it can’t have been painful). Although it’s advisable to have a course of six, I definitely felt a difference after one session from the moment I climbed off the bed. My legs felt so loose and light that I felt I could run a marathon that moment. 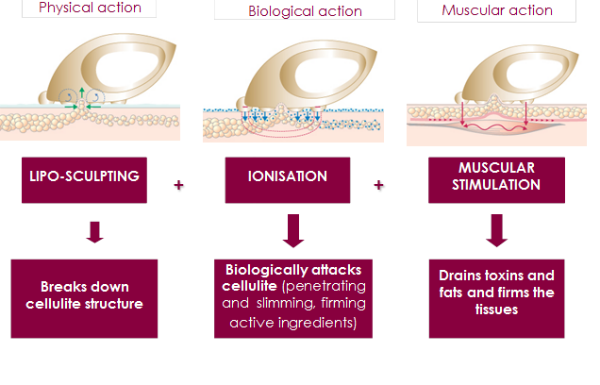 Cellulite is essentially a build-up of toxins that gathers around fat and so what had happened during the Technispa process was that some (maybe not all) of my toxins were broken down. That’s what I could feel straight away when I stood up. When I’ve had a few more treatments I’ll show you a Before and After photo so you can see for yourself. I will definitely be visiting Cobella again. If a treatment like this can be relaxing, I can only imagine how fabulous a massage or facial feels. Also, I’ve heard really good things about the salon’s Oxygen Facial using oxygen to infuse vitamins and minerals through the skin. Brand new treatments are coming in the Spring so if you’ve previously visited Cobella, maybe it’s time to check out again what they offer. Visit the Cobella website. Cobella is located at 5 Kensington High Street, London W8 5NP. 020 7717 9665.